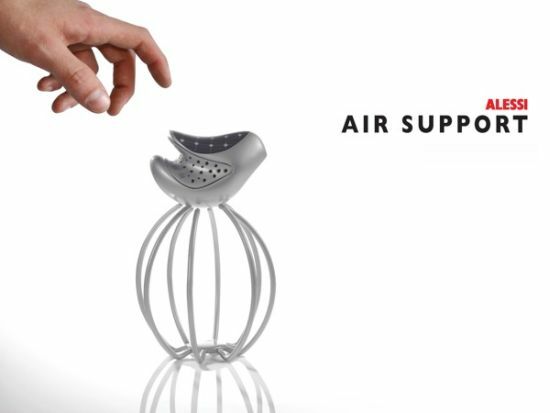 Conceived by designer Patrick Mulcahy, the Aessi Air Support detects household gas leaks like canaries used to do in a coalmine in ancient times. Moreover, it doubles as an emergency solar radio when a disaster occurs. Today gas leakage still occurs frequently with rates rising due to the increases in household gas use. However, in the past, when the canary stopped chirping, it was a signal to exit the mine. The proposed product stands in contrast with current emergency radios and in-home gas detectors which are not designed to be attractive in a household setting. They are highly industrial and an eyesore for those who admire household decors, especially the kitchen. Carved out of foam came this smooth organic bird like shape nesting on a supportive cage. Parting lines and manufacturing processes were taken into account for radio. Bottom cage constructed of heat bent acrylic joined by a chuck. Eight stainless steel legs join at the bottom for weight distribution and stability. Four contact points secure the solar radio to the base at resting position. Tail acts as power button with pinch click. When the Air Support detects toxic gas in surrounding area and sounds alarm, user simply needs to turn off gas. Grab the radio from off the cage and immediately exit. As mentioned above, Air Support also acts as a handheld radio that you can bring out of the home with you in emergencies.